Aurangabad ( pronunciation ; is a city in the Aurangabad district of Maharashtra state in India. The city is a tourism hub, surrounded by many historical monuments, including the Ajanta Caves and Ellora Caves, which are UNESCO World Heritage Sites, as well as Bibi Ka Maqbara and Panchakki. The administrative headquarters of the Aurangabad Division or Marathwada region, Aurangabad is titled "The City of Gates" and the strong presence of these can be felt as one drives through the city.The City was founded in 1610 by Malik Amber which in the year 2010 completed 400 years. Aurangabad is the Tourism Capital of Maharashtra. Aurangabad is the fifth largest City in Maharashtra. Khadki was the original name of the village which was made a capital city by Malik Ambar, the Prime Minister of Murtaza Nizam, Shah of Ahmadnagar. Within a decade, Khadki grew into a populous and imposing city. Malik Ambar died in 1626. He was succeeded by his son Fateh Khan, who changed the name of Khadki to Fatehnagar. With the capture of Daulatabad by the imperial troops in 1633, the Nizam Shahi dominions, including Fatehnagar, came under the possession of the Moghals. In 1653 when Mughal prince Aurangzeb was appointed the viceroy of the Deccan for the second time, he made Fatehnagar his capital and renamed it Aurangabad. Aurangabad is sometimes referred to as Khujista Bunyad by the Chroniclers of Aurangzeb's reign. In 1724, Asif Jah, a Turkic general and Nizam al-Mulk of the Mughals in the Deccan region, decided to secede from the crumbling Mughal Empire, with the intention of founding his own dynasty in the Deccan and decided to make Aurangabad his capital. His son and successor, Nizam Ali Khan Asaf Jah II transferred his capital from Aurangabad to Hyderabad in 1763. In 1795, the city came under the Maratha rule, following the Maratha victory in the Battle of Kharda, along with an indemnity of 30 million rupees paid by Ali Khan Asaf Jah II, Nizam of Hyderabad to the Marathas. However, Maratha rule lasted only eight years before the city came under the rule of the Nizam of Hyderabad, under the protection of the British East India Company, following the British victory in the Second Anglo-Maratha War. 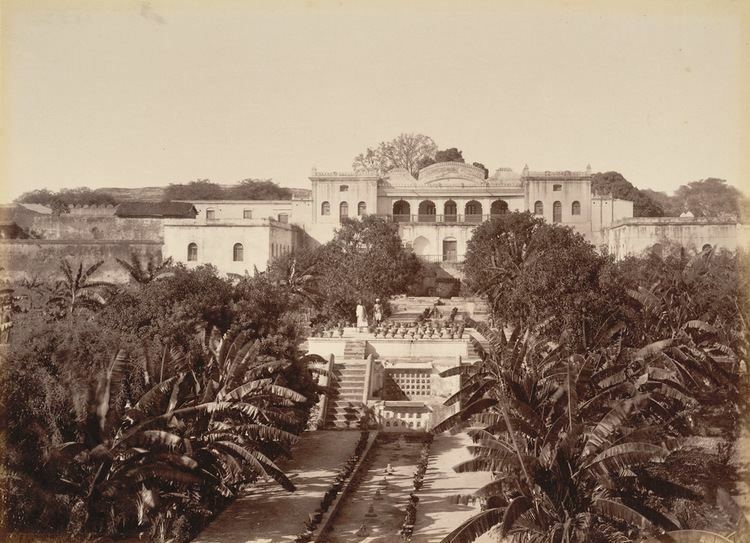 During the period of the British Raj, the city was known as Aurungábád. Aurangabad was a part of the Princely State of Hyderabad during the British Raj, until its annexation into the Indian Union after the Indian Independence in 1947, and thereafter a part of Hyderabad state of India until 1956. In 1956 it became a part of newly formed bilingual Bombay state and in 1960 it became a part of Maharashtra state. The co-ordinates for Aurangabad are N 19° 53' 47" – E 75° 23' 54". The city is surrounded by hills on all directions. Climate Classification: Aurangabad features a semiarid climate under the Köppen climate classification. Temperature: Annual mean temperatures in Aurangabad range from 17 to 33 °C, with the most comfortable time to visit in the winter – October to February. The highest maximum temperature ever recorded was 46 °C (114 °F) on 25 May 1905. The lowest recorded temperature was 2 °C (36 °F) on 2 February 1911. In the cold season, the district is sometimes affected by cold waves in association with the eastward passage of western disturbances across north India, when the minimum temperature may drop down to about 2 °C to 4 °C (35.6 °F to 39.2 °F). Rainfall: Most of the rainfall occurs in the monsoon season from June to September.Thunderstorms occur between November to April. Average annual rainfall is 710 mm.The city is often cloudy during the monsoon season and the cloud cover may remain together for days. The daily maximum temperature in the city often drops to around 22 °C due to the cloud cover and heavy rains. The entire area is covered by the Deccan Traps lava flows of Upper Cretaceous to Lower Eocene age. The lava flows are overlain by thin alluvial deposits along the Kham and Sukhana river. The basaltic lava flows belonging to the Deccan Trap is the only major geological formation occurring in Aurangabad. The lava flows are horizontal and each flow has two distinct units. The upper layers consist of vesiculara and amygdaloidal zeolitic basalt while the bottom layer consists of massive basalt.The lava flows are individually different in their ability to receive as well as hold water in storage and to transmit it. The difference in the productivity of groundwater in various flows arises as a result of their inherent physical properties such as porosity and permeability. The groundwater occurs under water table conditions and is mainly controlled by the extent of its secondary porosity i.e. thickness of weathered rocks and spacing of joints and fractures. The highly weathered vesicular trap and underlying weathered jointed and fractured massive trap constitutes the main water yielding zones. The soil is mostly formed from igneous rocks and are black, medium black, shallow and calcareous types having different depths and profiles. 2011 census has put the city of Aurangabad in million plus metro club of India. The city municipal area has total population of 1,171,260 while population including metropolitan area counts to 1,413,711. It is the 5th most populous city in Maharashtra after Mumbai, Pune, Nagpur and Nashik. 52.5% of Aurangabad's population is in the 15–59 years age category. Around 11% of the population is under 6 years of age. The Marathi and Hyderabadi Muslim communities are the two largest ethnic groups in the city. Hinduism is the majority religion in Aurangabad city at 51.07% with 600,183 followers. Islam is the second most popular religion in the city with 361,817 people (30.79%) following it. Buddhism is followed by 178,307 people (15.17%), Christianity is followed by 10,060 people (0.86%), Jainism by 19,073 (1.62%), Sikhism by 3,427 (0.29%). Around 0.04% stated 'other Religion', and about 0.15% stated 'No Particular Religion'. As one of the largest cities in India, and as a result of its many colleges and universities, Aurangabad is emerging as a prominent location for IT and manufacturing. There is evidence to believe that Aurangabad was developed as a trading hub four centuries ago. Aurangabad is one of the fastest developing cities in Asia. It tops the chart among the developing cities. It lies on a major trade route that used to connect north-west India's sea and land ports to the Deccan region. In 2010, Aurangabad was in news for placing single largest order for Mercedes Benz cars in a single transaction in India — 150 Mercedes Benz cars worth Rs 65 crore. Without a local Mercedes-Benz showroom and encountering an indifferent Mercedes-Benz dealer in the nearest city, a group of successful citizens pooled their orders and negotiated a record agreement with the firm. Soon after that, bulk purchase order of 101 BMW cars was also placed. Electronics giant Videocon has its manufacturing facility in Aurangabad where it manufactures a range of home appliances. 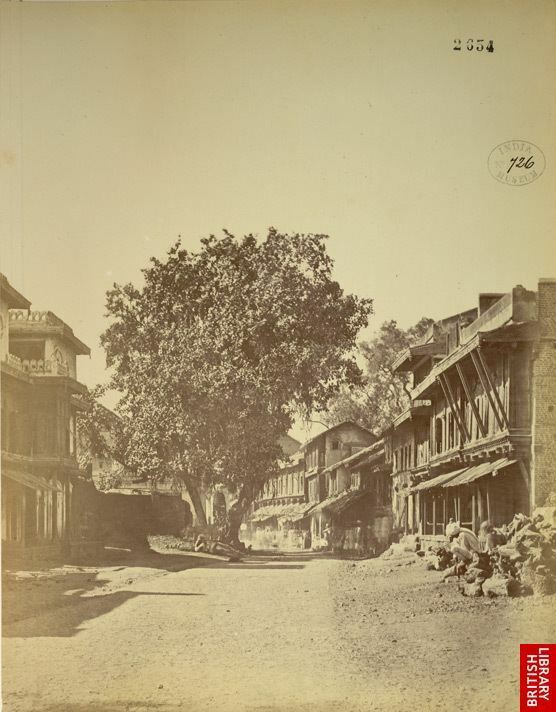 The city was a major silk and cotton textile production centre. A fine blend of silk with locally grown cotton was developed as Himroo textile. Paithani silk saris are also made in Aurangabad. With the opening of the Hyderabad-Godavari Valley Railways in the year 1900 several ginning factories were started. After 1960, Maharashtra Industrial Development Corporation (MIDC) began acquiring land and setting up industrial estates. Aurangabad is now classic example of efforts of state government towards balanced industrialisation of state. Major Industrial areas of Aurangabad are Chikhalthana MIDC, Shendra MIDC and Waluj MIDC. A new industrial belt namely Shendra - Bidkin Industrial Park is being developed under DMIC. The Maharashtra Centre For Entrepreneurship Development's main office is in Aurangabad. Modern Retail Industry has made its presence felt in the forms of Malls. Prozone Mall spread over 1 million square feet is the biggest in the region. The industry is a big employment generator. Prozone alone created direct employment opportunities for 4000 people. Aurangabad Municipal Corporation (AMC) is the local civil body. It is divided into six zones. The Municipal Council was established in 1936, the Municipal Council area was about 54.5 km2. It was elevated to the status of Municipal Corporation from 8 December 1982, and simultaneously including eighteen peripheral villages, making total area under its jurisdiction to 138.5 km2 extended its limits. The city is divided in 99 electoral wards called as Prabhag, and each ward is represented by a Corporator elected by the people from each ward. There are two Committees, General Body and Standing Committee headed by the Mayor and the Chairman respectively. AMC is responsible for providing basic amenities like drinking water, drainage facility, road, street lights, healthcare facilities, primary schools, etc. AMC collects its revenue from the urban taxes which are imposed on citizens. The administration is headed by the Municipal Commissioner; an I.A.S. Officer, assisted by the other officers of different departments. Aurangabad division is one of the six administrative divisions of Maharashtra state in India. Aurangabad divisions almost completely coincides with the Marathwada region of Maharashtra. Aurangabad contributes one seat to the Lok Sabha – Aurangabad (Lok Sabha constituency). The seat is currently held by Mr. Chandrakant Khaire, MP of the Shiv Sena party. In latest constituency arrangements made by, Aurangabad will contribute one Loksabha seat, and three state assembly seats namely Aurangabad East, Aurangabad West and Aurangabad Central. The latest MLAs being – Aurangabad (East) – Atul Moreshwar Save(BJP), Aurangabad (Central) – Imtiyaz Jaleel (AIMIM) and Aurangabad (West) Sanjay Shirsat of Shiv-Sena. Aurangabad Airport (Chikkalthana Airport) is an airport serving the city and has connecting flights to Hyderabad, Delhi, Mumbai, Bangalore, Tirupati and Thiruvananthapuram. In 2008, flights were made available to the people travelling to the Hajj pilgrimage. Dr. Babasaheb Ambedkar Marathwada University (BAMU) is located in Aurangabad city. Most of the colleges of the region are affiliated to it. The University has 101 Colleges affiliated in Aurangabad and similarly 99 Colleges in Beed, 53 & 55 Colleges affiliated in Jalna & Osmanabad. Aurangabad has schools run by the Aurangabad Municipal Corporation (AMC) and private schools owned and run by trusts and individuals. Government Polytechnic Aurangabad is one of the polytecnique institutions in marathawada region. Government College of Engineering, Aurangabad is an Autonomous engineering college in Maharashtra State of India. It was affiliated to the Dr. Babasaheb Ambedkar Marathwada University and was established in 1960. The construction of the college was started in 1957 and was completed in 1960.Marathwada Institute of Technology and Jawaharlal Nehru Engineering College are two other prominent engineering colleges in Aurangabad. Maulana Azad College of Arts and Science was founded in 1963 by Dr.Rafiq Zakaria, who formed a trust called Maulana Azad Education Society to manage the affairs. The College is affiliated to Dr. Babasaheb Ambedkar Marathwada University of Aurangabad. National Institute of Electronics & Information Technology Aurangabad(NIELIT Aurangabad) is located inside the Dr B.A.M. university campus. It is a central government engineering institute under the Ministry of Communication & Information Technology Government of India. It offers DEPM, B.TECH(Electronics Engineering), M.tech(Electronics Design Technology), P.hd and short term courses. Institute of hotel management aurangabad is affiliated with the TAJ hotels. Students have internships in the Vivanta, taj in aurangabad which is a 5 star hotel Aurangabad is educational hub of Marathwada. Aurangabad Cantonment is the greenest area of the Aurangabad city. It also has a nine-hole golf course, the only such course in Marathwada region. Aurangabad Cantonment was formed in 1819 with European officers to train the Nizam Army. In 1903, a treaty was signed between British and the Nizam, and it was decided to establish a proper cantonment. Today the cantonment is spread across 2,584 acres (10.46 km2) with civil population of 19,274 as per 2001 census. Aurangabad is a very historical city along with its surrounding towns and villages. It receives tourists and surveyors from all over the world. Ellora and Ajanta Caves: The world-famous Ellora and Ajanta Caves are situated at 29 km (18 mi) and 107 km (66 mi) respectively from Aurangabad city and come within the Aurangabad district. The Ellora Caves consist of 34 caves built between 5th and 10th century CE under the patronage of Rashtrakuta Dynasty. They represent the epitome of Indian rock cut architecture. 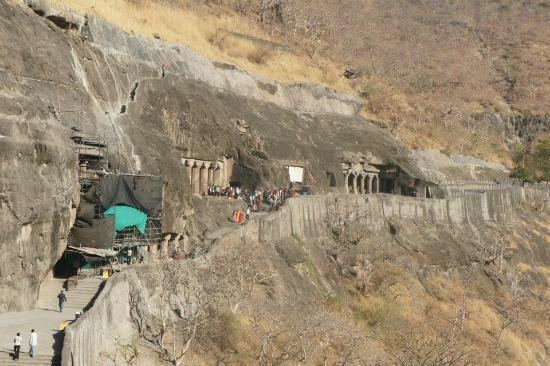 The Ajanta Caves are also 30 rock cut caves around a gorge, built by the Satavahana, Vakataka and Chalukya dynasties between 2nd and 5th century CE. They contain the rarest and finest surviving examples of ancient Indian art, especially painting. Both the Ellora and Ajanta Caves are UNESCO World Heritage Sites. Bibi Ka Maqbara: The Aurangabad city is known for the Bibi Ka Maqbara situated about 3 km (2 mi) from the city which is the burial mausoleum of Emperor Aurangzeb's wife, Dilras Banu Begum also known as Rabia-ud-Daurani. It is an imitation of the Taj Mahal at Agra and due to its similar design, it is popularly known as the "Taj of the Deccan". Daulatabad Fort: The Daulatabad Fort (aka Devgiri Fort) located about 15 km (9 mi) north-west of Aurangaabd was one of the most powerful forts during the medieval period. Built in the 12th century CE by the Yadava Dynasty, it's a citadel that was never conquered by any military force. The British called it the "best fort of India", due to its extraordinary military strength. Built on a 200 metre high conical hill, the fort was defended by moats and trenches running around the hill at its foot besides the most complex and intricate defence system. The fort has two fixed massive canons which can be pivoted. The fortifications comprise three encircling walls with bastions. Panchakki: The 17th-century water mill (Panchakki) situated at a distance of 1 km from the city is known for its underground water channel, which traverses more than 8 km. to its source away in the mountains. The channel culminates into an artificial waterfall that powers the mill. Gateways: The city is also famous for the 52 gateways built during Mughal era which gives it the name of "City of Gates". Aurangabad Caves: These are situated at a distance of 5 km (3 mi), nestled amidst the hills are 12 Buddhist caves dating back to 3 A.D. Of particular interest are the Tantric influences evident in the iconography and architectural designs of the caves. Grishneshwar Temple: It is one of the 12 jyotirlinga shrines in India. The present temple was built by Ahilyabhai Holkarof in 18th century CE. The structure is a unique example of Bhoomija architecture with a Maratha style influence. Salim Ali Lake & Bird Sanctuary: Popularly known as Salim Ali Talab is located in the northern part of the city near Delhi Darwaza, opposite Himayat Bagh. During the Mughal period it was known as Khiziri Talab. It has been renamed after the great ornithologist and naturalist Salim Ali. It also has a bird Sanctuary and a garden maintained by the Aurangabad Municipal Corporation. Tomb of Aurangzeb: The tomb of the last Mughal emperor Aurangzeb is located in the village of Khuldabad, 24 km (15 mi) to the north-west of Aurangabad in Aurangabad district It is located in the south-eastern corner of the complex of the dargah of Sheikh Zainuddin. Kachner Jain Temple: This is a 250 years old temple dedicated to Parshvanath. The idol here is called Chintamani Parshvanath. The culture of Aurangabad city is heavily influenced by Hyderabad. The old city still retains the cultural flavour and charms of Muslim culture of Hyderabad. Its influence is reflected in the language and cuisine of the locals. Although Marathi and Urdu are the principal languages of the city, they are spoken in Dakhni – Hyderabadi Urdu dialect. Wali Dakhni also known as Wali Aurangabadi (1667–1731 or 1743) was a classical poet of Urdu from Aurangabad. He was the first established poet to have composed in Urdu language. Prominent poets like Shah Hatem, Shah Abro, Mir Taqi Mir, Zauq and Sauda were among his admirers. Other prominent poets from Aurangabad include Siraj Aurangabadi, Azad Bilgrami and Sikandar Ali Wajd. Abul Ala Maududi one of the Muslim scholars (1903–1979) was born in Aurangabad, India. Syed Abul A'ala Maududi was born to Maulana Ahmad Hasan, a lawyer by profession. His father was "descended from the Chishti line of saints. He was also the founder of Jamaat-e-Islami, the Islamic revivalist party. Aurangabadi food is much like Mughlai or Hyderabadi cuisine with its fragrant pulao and Biryani. Meat cooked in fresh spices and herbs is a speciality, as are the delectable sweets. The local cuisine is a blend of Mughlai and Hyderabadi cuisine, with an influence of the spices and herbs of the Marathwada region. Naan Qalia is a dish that is associated with Aurangabad in India. 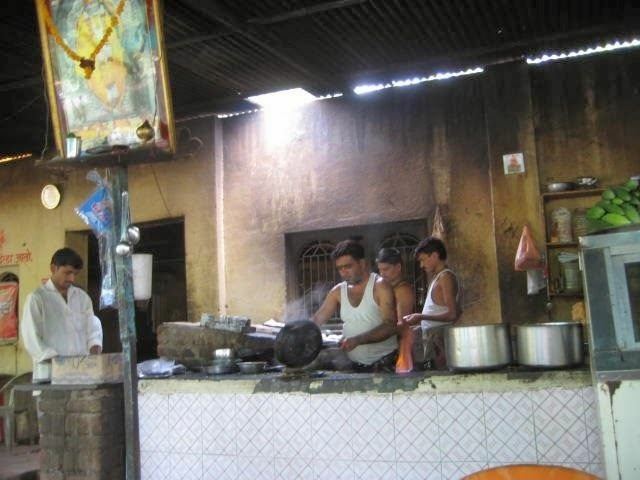 It is a concoction of mutton and a variety of spices. Naan is the bread made in tandoor (Hot furnace) while Qalia is a mixture of mutton and various spices. Tahri or Tahari is similar to pulao–Biryani and is very popular in Aurangabad and Marathwada. Tahri is prepared by adding the meat to the rice, as opposed to traditional Biryani where the rice is added to the meat. Aurangabad / Marathwada / Dakhni cuisine is a blend of the Puneri and the Hyderabadi cuisine (which beautifully blends the use of typical South Indian ingredients such as curry leaves, tamarind and coconut into their celebrated culinary practices). International-standard cricket stadium at Aurangabad District Cricket Association Stadium is under counstruct. Jawaharlal Nehru Engineering College Sports Complex is a sports complex with in Jawaharlal Nehru Engineering College mainly used by college sports event. Aurangabad is home to the national bandy association. Aurangabad is famous for Mashru and Himroo fabrics made of cotton and silk with the lustre of satin. Himru is an age-old weaving craft, and was originally known as kum khuab. Himroo: The fabric is said to have originated in Persia, though not conclusively proved, Himroo is associated with the times of Mohammad Tughlaq who ruled in the 14th century. When Mohammad Tughlaq shifted his capital from Delhi to Daulatabad many weavers came and settled here. During the exodus the weavers instead of returning to Delhi stayed back here. During the reign of Malik Ambar, the city's fame attracted many people from far and wide. During the Mughal rule under Aurangzeb's governorship, Auarangabad the capital and the weavers became more prosperous. The only industry in Aurangabad allured hundreds of craftsman. Members of the royal family and an elite few used the famous Aurangabad Himroo. Himroo weaving is very characteristic and distinctive. Fabrics and shawls from Aurangabad are much in demand for their unique style and design. Bidriware : A unique form of gold and silver inlays on copper is preserved here from ancient Persian traditions that have been sustained in the Deccan. This ancient art still finds expression in the modern items like cufflinks, nameplates and more. Typical bidri items include plates, bowls, vases, ashtrays, trinket boxes, huqqa bases and jewellery. Kaghzipura: A place situated near Daulatabad made first handmade paper in India after the technology was brought here by Mongol invaders.Some Historians say it was the first mill in entire Asia to produce paper. Interestingly this paper was first used to print the Quran.